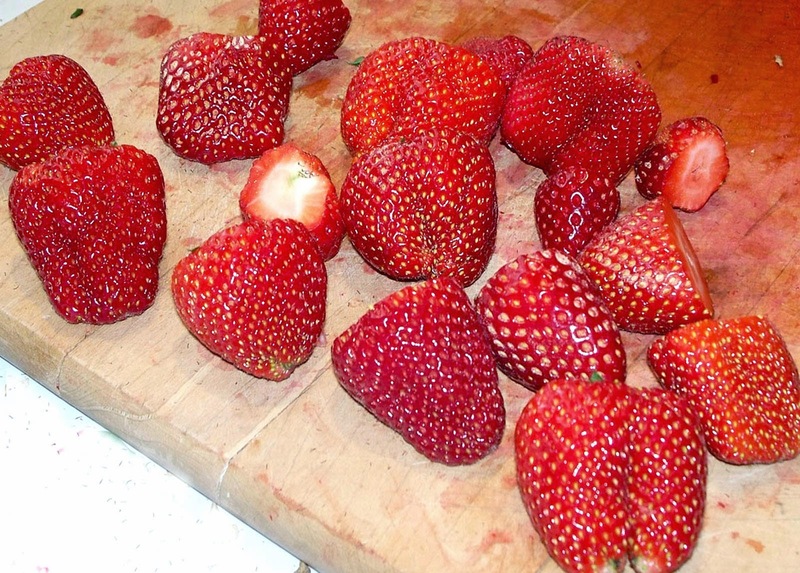 This week's Farm Fresh in the Kitchen blog is "all about STRAWBERRIES!" You know, those luscious little red berries who make their appearance here every Spring ... the ones you wait all winter for ... well they're back! Did you know? The heart-shaped silhouette of the strawberry is the first clue that this fruit is good for you. These potent little packages protect your heart, increase HDL (good) cholesterol, lower your blood pressure, and guard against cancer. 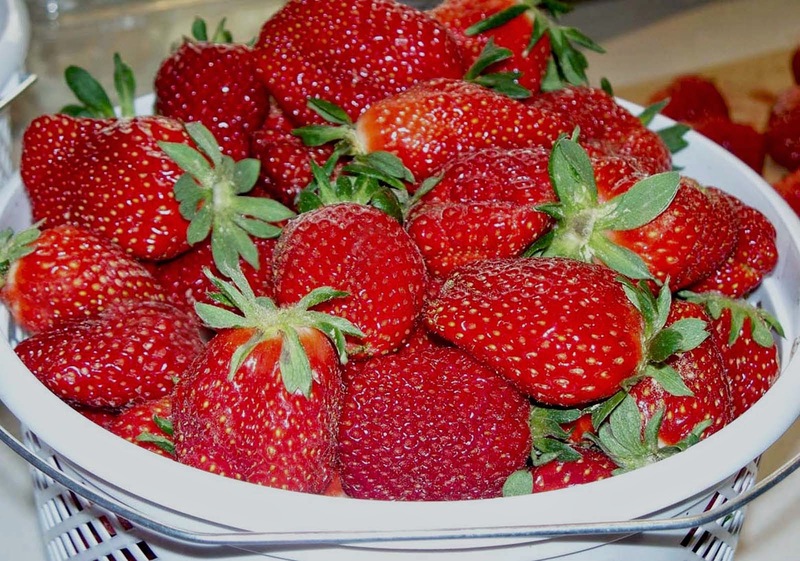 Over 53 percent of seven to nine year old's picked strawberries as their favorite fruit. Native forms of strawberries adapt to various climates and are indigenous to every major continent except Africa, Australia and New Zealand. The fruit size of the very early strawberries was very small. Seventy per cent of a strawberry's roots are located in the top three inches of soil. One cup of strawberries is only 55 calories. The flavor of a strawberry is influenced by weather, the variety and stage of ripeness when harvested. On average, there are 200 seeds in a strawberry. Ninety-four per cent of United States households consume strawberries. According to the United States Department of Agriculture, the annual per capita consumption of fresh and frozen strawberries is 4.85 pounds. Strawberries are grown in every state in the United States and every province of Canada. Tip - Use a vinegar wash to help keep your berries fresh longer! Now, where can you go for some fresh, South Carolina strawberries? Fortunately for us, there are two local farms right here in Sumter County where these lovely little berries are available! Hours: Monday through Saturday 9 a.m.-7 p.m.; Sunday noon-6 p.m. Hours: Friday and Saturday 9:30 a.m.-5:30 p.m., Sunday noon-5:30 p.m.
(we'll open other days of the week when we have groups scheduled). The market at Willard Farms offers a variety of favorite jar products, including everyone's favorite "Summer Tomato Salad Dressing." They also offer premium, hand dipped ice cream, home made fudge or their famous "Willard Burger" hamburger, voted "Best in the State," hot dogs, chicken salad and more. Mix Jello in boiling water; chill until almost set. 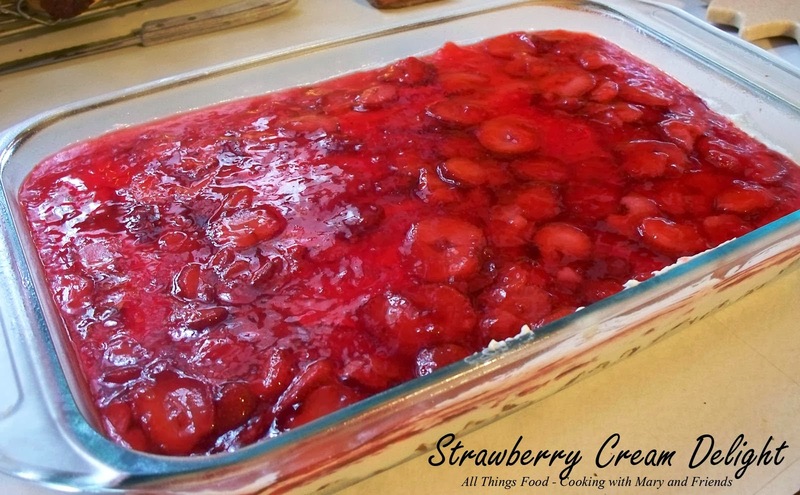 Add strawberries and keep chilled until ready to use. Mix cream cheese, powdered sugar, and Cool Whip; set aside. In a 13 x 9 x 2 inch pan, mix the crushed graham crackers, sugar, and melted butter and press into the bottom of the pan. Pour cream cheese mixture over crust. Pour jello and strawberry mixture on top of the cream cheese mixture. Chill 1 hour before serving. Cut and enjoy this delicious strawberry delight. Scrumptious!